Berry Christmas - a red hand-tied luxury bouquet. Florist delivered. 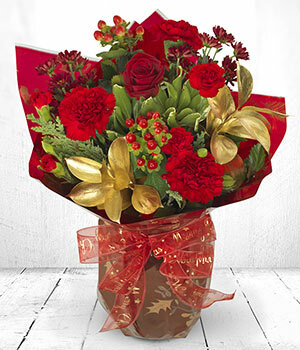 A stunning red and gold hand-tied bouquet, tied with a festive bow. Red roses, carnations, hypericum and chrysanthemum are perfectly accented by gold and green seasonal foliage. Lovingly created by a local florist and delivered by hand, this bouquet is a beautiful way to send the very best of the season.